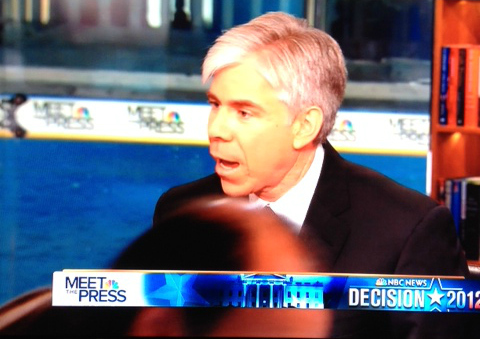 The kabuki theater continued on Meet The Press again this morning. Host David Gregory introduced two guests, showed them seated together, ready to talk… and then spoke to them one at a time. David Axelrod, senior adviser to the Obama re-election campaign, seemed to have a little fun with the weird format. He referred directly to the other guest, Republican National Committee Chair Reince Priebus, by name a couple of times… knowing full well that Priebus would not be allowed to respond. 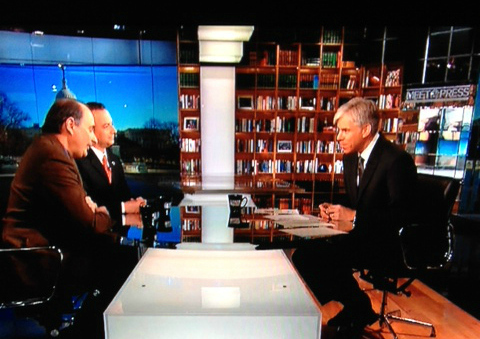 David Gregory (right) prepares for what looks like a discussion with David Axelrod (left) and Reince Priebus (center). But then something different happened. David Axelrod stands to leave the Meet The Press studio. Then when Axelrod was done and Priebus was allowed to speak, the camera got a pretty clear shot of Axelrod standing up to leave the room. I still don’t understand the false pretense of the opening shot establishing a multi-person discussion but then doing sequential interviews. The same kind of establishing shot is used before the actual roundtable discussion among people in the second half of the show… except that it is actually followed by a roundtable discussion. I am not sure that having Axelrod and Priebus directly address each other would have produced a better discussion, I just don’t understand why the show is using a bait-and-switch technique in the set up. OK. Now that I have that out of my system… Gregory began with the new NBC News/Marist Poll of the Republican presidential race. In New Hampshire, Mitt Romney leads with 39%, Newt Gingrich has 23%, Ron Paul 16%, and the rest in single digits. In Iowa, Newt Gingrich leads with 26%, Mitt Romney is at 18%, Ron Paul 17%, and the rest in single digits. For Axelrod, the first question was about the seemingly improved unemployment numbers which may have gone down only because more people have dropped out of the work force. Axelrod says new jobs have been created by the Obama Administration at the same time that the Republicans in Congress want to erase the payroll tax cuts. Gregory pressed Axelrod on why the administration ignored the Simpson-Bowles deficit reduction recommendations. Axelrod said a lot of the Simpson-Bowles ideas were incorporated into the president’s plan. He adds that the president was “willing to lock arms with the speaker [John Boehner (R-OH)] and move forward on a $4 trillion plan to reduce the deficit,” but the speaker’s caucus wouldn’t allow it. Gregory points out the Democrats use of “no moral core” as a description of Mitt Romney. Axelrod responds that this is about Romney’s public leadership record, not his personal life. Priebus defends the competition playing out in the GOP presidential field saying that it produces stronger candidates. Gregory tries to get Priebus to discuss some of the more controversial things Newt Gingrich has said and the idea of a Donald Trump moderated debate, but Priebus won’t comment. In the roundtable, Time magazine Editor-at-Large Mort Halperin says Herman Cain’s exit from the GOP presidential nomination race matters because we have all been waiting to see if the anti-Romney conservatives will unite behind a single figure. If Cain supporters go to Gingrich, this could be the start of that uniting. However, Gregory then showed a poll where they redistributed Cain’s support to Cain voter’s self-described second choices, and it was “all over the place,” according to Gregory. No single candidate really gained much. There was much discussion about Gingrich’s propensity to make grandiose statements, particularly about himself. There was a general sense that what excites conservatives about Gingrich right now will turn off independent voters in the general election. The next round was about Romney’s week and the persistent “flip flop” image. I didn’t hear anything new here.